Through history, fifteen lighthouse keepers, two of whom were women, have tended the beacon. The first keeper was Benajah Wolcott, a Revolutionary War veteran and one of the first settlers on the peninsula. He and his family lived in a small stone home on the Sandusky Bay side of the peninsula. Each night, he lit the wicks of the thirteen whale oil lamps that were the original light fixture. Sixteen-inch-diameter metal reflectors helped project the light across the lake. Other duties of the lighthouse keeper included keeping a log of passing ships, noting the weather conditions, and organizing rescue efforts. Upon Wolcott's death in 1832, his wife, Rachel, took over these duties. 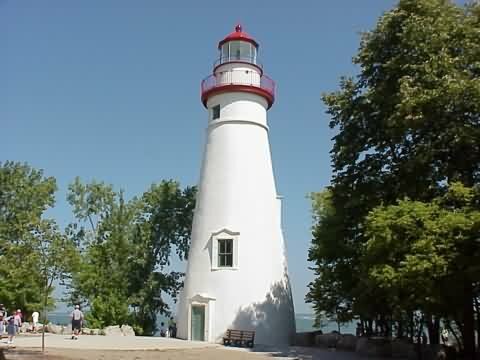 The Ohio Department of Natural Resources has maintained the property surrounding the lighthouse since 1972 and proudly accepted ownership of the Marblehead Lighthouse tower in May 1998. The U.S. Coast Guard continues to operate and maintain the lighthouse beacon. Today's 300 mm lens projects a green signal that flashes every six seconds and is visible for eleven nautical miles. The distinctive green distinguishes the lighthouse signal from white lights coming from air beacons. Tours are offered on weekday afternoons from 1:00 p.m. to 4:45 p.m. through August, and on the second Saturday of the month from June through October. From SR-2 take the exit for Danbury Rd/SR-135(A) in Port Clinton. Once at the intersection with SR-135A, take a right onto SR-135A (E. Bayshore Rd). In 0.3 miles at the intersection with SR-269, take a left onto SR-269. This will continue to be E. Bayshore Rd. In another 0.3 miles, SR-269 goes to the left. Continue straight on E. Bayshore Rd., which now has become SR-135. Continue on SR-135 for 7.5 miles when the road then becomes SR-163. Keep going straight. In 0.6 miles take a right onto Lighthouse Rd. There is a church on the corner of Lighthoues Rd. and SR-163. Go to the end of the short road and park at the lighthouse.